Noble Basin The Eagle Prospect exploratory well project is located behind the first ridge in this photo. The Bridger-Teton National Forest hosted two public meetings this week to give out information and answer questions about the Plains Exploration & Production Company (PXP) exploratory gas well project in Noble Basin. The project is located in the Hoback River drainage seven miles southeast of Bondurant and west of the Hoback Ranches subdivision. An Environmental Impact Statement is being prepared for the project. When the public scoping notice was originally announced, it raised the concern of many local residents about gas and oil well drilling moving from the desert wasteland of the Mesa into the forests of the northern Wyoming Range and scenic areas of the Bridger-Teton National Forest. Representatives from the Big Piney Ranger District, the Bureau of Land Management and PXP were on hand to hear these concerns, answer questions and explain handouts and project maps. PXP proposes to drill three exploratory gas wells at the Eagle Prospect project site. First, a vertical well would be drilled. If that proves up, two additional horizontal wells would be drilled from the original down hole, one to the west and another to the south. Total surface disturbance would be for the 3-acre well pad. Road construction involved would be reconstruction of 7.3 miles of existing road and 4.2 miles of new road construction to access the drill site. The project would begin in 2007 and is hoped to be completed before the snow flies at the end of the summer. Even though the project is on National Forest land, the below ground mineral rights are administered by the BLM. The Forest Service is responsible for the above-ground activities and the BLM manages all federal mineral leases. Some of the federal lease mineral rights extend under the private land owned by Hoback Ranches landowners, creating a controversial split estate situation. While drilling and wells have been located in the area in years past, all came up dry and were sealed off. According to Big Piney District Ranger Greg Clark, there are very few active well projects on the Big Piney District. In his experience working in the district, more between 140-150 exploratory well holes have been drilled and abandoned in the 18 years he has been in the area. Most were done in the 1980s. Plains representatives believe that new technology may allow them to access and recover gas product that they could not get in years past. "The last well we put in on the forest was in 1997," Clark said. The Eagle Prospect well area was leased ten years ago. Clark explained that at that time there were few full-time people living in the Hoback Ranches area and there were no objections raised at the time that were significant enough to prevent issuing the leases. A number of people attended the Pinedale public hearing and voiced their objection to the project. Some were residents of Hoback Ranches, others speaking as concerned citizens living in the area. It was clear that some people didn’t like the idea of gas well projects moving onto the National Forest, period, and no amount of mitigation, comments about the national need and government push for more gas production, or reassurances about utmost care of the resource during the project appeared to satisfy those who felt that way. "You are going to be looking at a part of Sublette County that is still a unique jewel," said one person. "We’re going to have a snowball effect. It will be a damn eyesore. It will open the door and won’t stop." Clark said he has had some people ask him to just stop the leases. He explained that they were sold years ago and he cannot stop the lease. "It’s a property right," he said. "It is beyond my discretion." The lease holder has a right to drill and the responsibility to develop the potential of the leases. "We’re not looking at ‘IF’ this well will go in," Clark said. "What I’m really looking at here is what is the best way to get this well in here in an environmentally sound way." Other issues raised by Hoback Ranches residents related to possible contamination of their water wells, traffic and light pollution from the drill rig. The road access for this project would be through the Beaver Creek south access and no roads or traffic from the project would go past or through the Hoback Ranches area. The project area is several miles and ridges away from the subdivision, so it is unlikely that project personnel would come in contact with the Hoback home owners. The road access route will affect residents of Beaver Ridge, Horse Creek/Merna Road, and Jim Bridger and Rendezvous Ridge subdivisions, but no comments were made objecting to the project from anyone identifying themselves as from those areas. No one from the real estate industry voiced objections about the project during the open session. 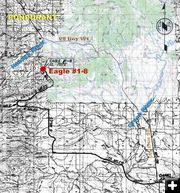 The Big Piney Ranger District would not agree to the original PXP drill location, which was on top of a ridge within line of site of Hoback Ranches homes. PXP and the District worked together to find another drill site behind the ridge so the lights from the tall drill rig would not be directly visible to anyone in Hoback Ranches. They will be able to see the light glow during the 1-2 months of the actual drilling, but then the lights would be gone once the drill rig is removed. The other major issue raised by Hoback Ranches landowners related to concerns about possible contamination of their water wells. "There are some 900 foot wells that are there that are dry in Hoback Ranches," one resident said. Clark explained, "What they are looking at drilling is very deep and casing in concrete. It will keep it from impacting any water wells." The gas well drilling will be at a depth of between 10,000 to 12,500 feet, far below any water well aquifers. One attendee commented that the Hoback Ranches landowners probably have more danger of water well contamination from their neighbor’s septic leach fields than from anything related to this exploratory drilling project. Some Hoback residents were also not happy about the fact that they had no control over what happened on their own land related to mineral development. Even though private residents own the surface land, the mineral rights underground are owned by the federal government. Most of the Hoback area has already been leased out by the federal government. However, that doesn’t mean residents will see a gas well drill rig in their back yards. Current technology allows companies to drill horizontal wells from up to 2 miles away, recovering the gas underground without disturbing the surface landowner in any way. PXP company representatives explained they often work in sensitive areas and next to private land and homeowners. They are experienced in doing it in a way that has a minimal impact, if at all, on the surface landowner. Another person brought up that the Hoback area is designated as "roadless" and asked why roads were being allowed in the area? The roadless designation was done in 1984. "There are numerous established roads that predate 1984," Clark explained. The roadless designation did not take away any existing rights for lease development so anyone who had an existing lease still has the right to develop that lease. The roadless designation also didn’t require elimination of preexisting roads. There are still many roads in that designated 'roadless area' that have been there many years are still being used for forest access purposes. The Wilderness Society (TWS) has spoken up in opposition to the project, releasing a report in late January entitled, The Wyoming Range: Wyoming’s Hidden Gem. "Our vision for the Wyoming Range is to keep intact the traditional uses -- the ranching, outfitting, education and recreation activities -- that currently occur in this wild country and help sustain local communities," said Peter Aengst of The Wilderness Society. "While there is a role for responsible energy development on our public lands, the Wyoming Range already has enough wells and is not the place for new development, especially given the natural gas boom happening in the adjacent Upper Green River Valley." Regarding ranch grazing use in the Wyoming Range, it is worthwhile to mention that at least one local rancher has recently taken a non-use for at least one summer on his Wyoming Range forest grazing permit due to heavy losses of cattle from wolf and grizzly bear predation while the livestock were on the forest. The Wilderness Society has an online public comment form supporters can fill out on their website to send in for public comment to the Forest Service. The TWS emphasis on the roadless area designation for this project seems to ignore the fact there are already many miles of existing roads in the area which have been used by locals for many years with trucks and 4-wheelers for general recreation and hunting access. A pre-written public comment in the form states, "…if you decide to go forward with your environmental impact analysis, I insist that you include a detailed alternative on sighting all operations so that no drill pads or roads would be constructed in roadless areas. I also ask that the Forest Service's analysis include an alternative requiring helicopter rig and crew transport, rather than allow further road building in this special landscape." Copies of TWS Wyoming Range pamphlet were available at the Pinedale public meeting. None of the Hoback Ranches residents made any comments about the potential noise and disturbance factors for the entire summer associated with the TWS request for an analysis alternative using helicopters for rig and crew transport to avoid the 4.2 miles of new road construction. Public comment on this project is being accepted until February 13, 2006. Mail written comments to: Greg Clark, District Ranger, Big Piney Ranger District, Box 218, Big Piney, WY 83113. Comments can also be e-mailed to: mailroom_r4_bridger_teton@fs.fed.us with "Eagle Prospect" in the subject line. Comments can also be made by phone by calling Teresa Trulock, Big Piney Ranger District, Project Manager, at 307-276-3375.